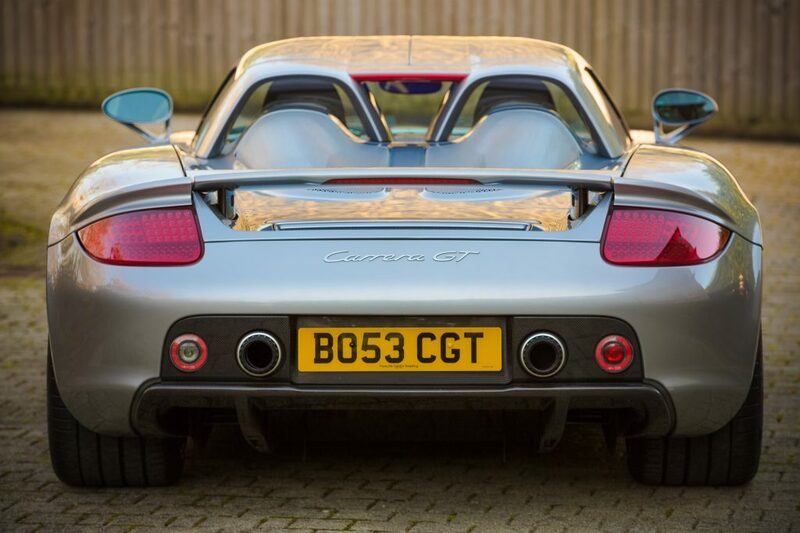 A stunning 2004 Porsche Carrera GT will headline a fantastic selection of supercars offered at Silverstone Auctions’ upcoming classic car sale at Race Retro, taking place at Stoneleigh Park, Warwickshire on the 27th-28th of February. The rare car is one of only 1,270 cars built by Porsche. This example, estimated at between £400,000 and £450,000, is finished in GT Silver Metallic with a black leather interior. Delivered new on 15th April 2004 by main dealer Champion Porsche of Pompano Beach, Florida, it left the factory with a superb specification. This included; air-conditioning, CD player with Bose HiFi, Porsche Online Pro Satellite Navigation, adjustable steering column, electric windows, buckets seats, and carbon ceramic brakes with yellow calipers. For the gentleman about town, this car comes supplied with a luggage set including a leather suit carrier, a leather briefcase bag and a leather day bag. The car was imported to the UK in 2009 by a collector in Gloucester who kept the car before it was purchased by businessman and F1 team principal, Gerard Lopez. 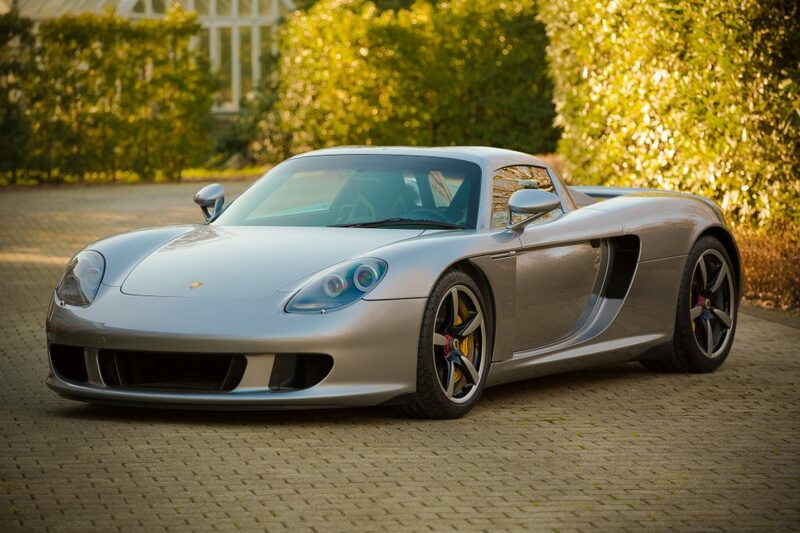 The current vendor took ownership of this exquisite supercar in September 2013 when it had covered a mere 12,737 miles, and immediately sent the car for a full service at Porsche Reading at a cost of £8,305. In 2014, the car was sent to RUF Porsche in Germany and was fitted with a suspension raising system at the cost of 11,900 Euros. The last full service was carried out in November 2015 at Porsche Reading, when the recorded mileage was 18,018. The Porsche joins several other supercars in the auction. 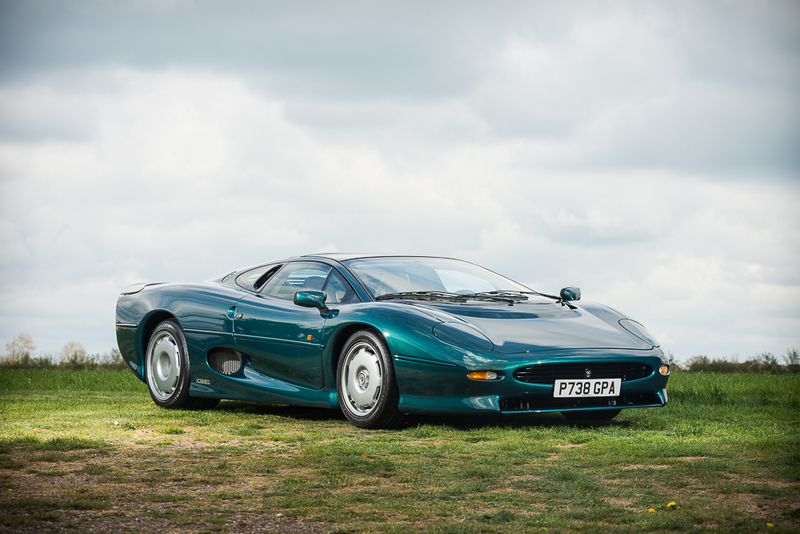 From Great Britain comes a 1994 Jaguar XJ220. This left-hand drive car, estimated at between £255,000 and £295,000 has covered a total mileage of 4,239 kilometres and has been professionally laid up and stored as part of a very significant private collection. In February 2011 it was sent to the respected Jaguar specialist, Don Law, where it had a new fuel cell fitted and all fuel related items serviced with the hoses being replaced with stainless steel over braid, along with a full 24 month comprehensive service. For those who prefer their supercars a little wilder, two of Lamborghinis’ finest offerings will be auctioned. Firstly a 2010 Lamborghini Murcielago 670-SV, estimated at between £300,000 and £340,000, and a rare right-hand drive 1981 Lamborghini Countach LP400 S, estimated at between £200,000 and £250,000. From Maranello comes a left-hand drive 1999 Ferrari F355 GTB F1 with just 5,462 miles from new and estimated at between £90,000 and £110,000. A UK supplied, right-hand drive 2008 Ferrari 430 Scuderia, presented in exemplary condition having covered just 7,500 miles from new, is estimated at between £170,000 and £190,000. To find out more about the cars on offer at Silverstone Auctions’ Race Retro Sale please visithttps://www.silverstoneauctions.com/race-retro-classic-car-sale-2016/view_lots/pn/all.